Quiet your mind with Howlite. With its soothing vibrations, your mind will calm and be open to accept new wisdom and insight. Howlite works on all chakras to reduce negative thoughts and expand your consciousness. When negativity is turned around, it becomes a strong champion to eliminate the things that are holding you back. On your path to enlightenment, Howlite is a powerful ally. Aqua Terra Jasper provides comfort and emotional healing. 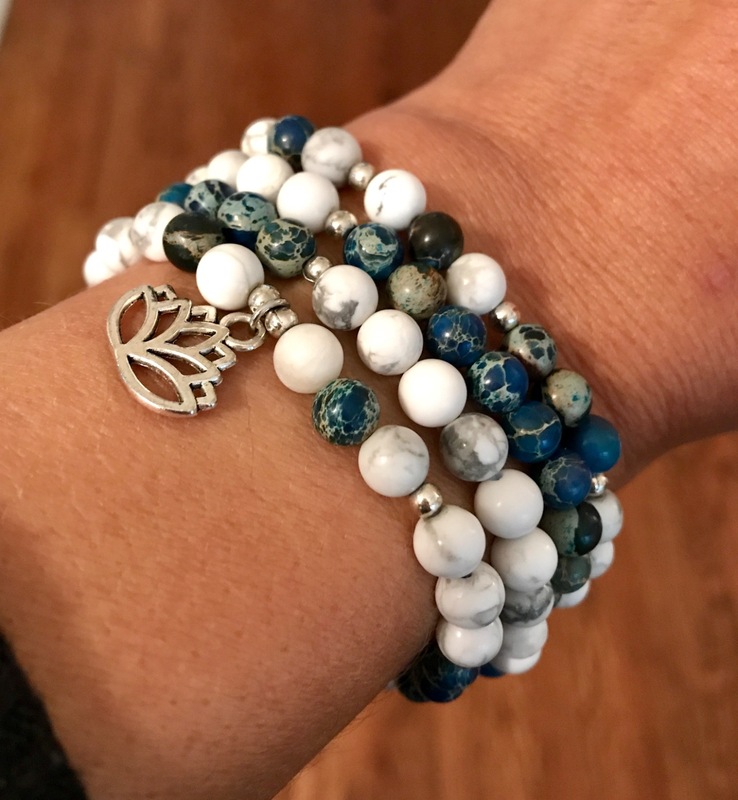 In order to truly expand your awareness, you must resonate with an inner peace that frees your mind.Aqua Terra Jasper promotes peace and harmony with its connection to the life-giving bodies of Earth and Water. It aligns the physical, mental, and spiritual aspects of your one true self. In balance, light and knowledge shine through. Howlite and Aqua Terra Jasper work together to promote harmony and peace. It is in this state that you will find true happiness in life. The Lotus flower pendant represents your personal transformation. It signifies the possibility of new beginnings. Love my bracelet! Stone were a bit smaller than what I expected, but love the color! I get so many compliments when I wear this and it's perfect for any cute outfit I wear! And when I enter my zen zone I have my beautiful Harmony mala to meditate with! THANK YOU! !